Every Summer, the Washington Post runs a Top Tomato contest. Readers submit their best tomato recipes. The Post follows the recipes and judges the results. In 2014, I made it into the final round. 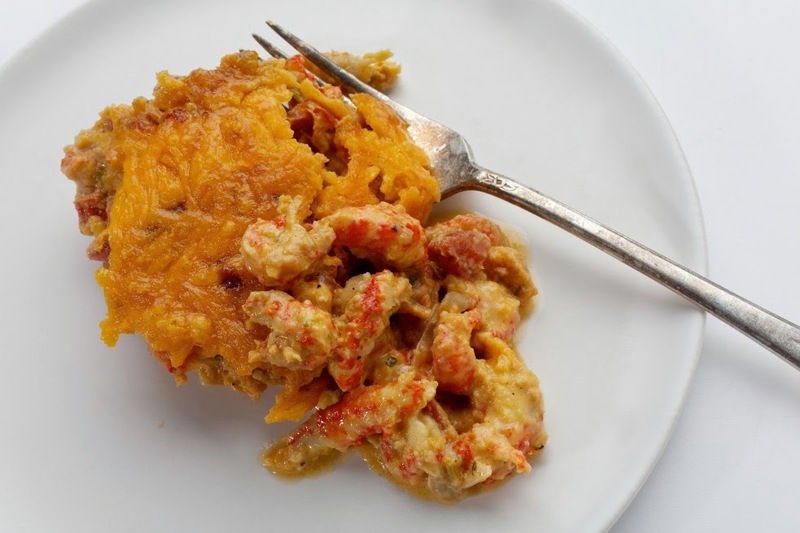 The recipe was this Crawfish and Smoked Tomato Gratin. The recipe came about as a result of an emergency. Our upright deep freezer door had come partially opened. By the time it was noticed, a few items had started to thaw. They had to be used right away. Among the items was some frozen crawfish tails and a pack of smoked tomatoes. I was about to leave on a business trip, and also had great chanterelle mushrooms and sweet corn that needed to be used. I needed a dish that would either use these items or pair well with them. I whipped up this gratin on a whim, and it turned out to be pretty good! It went well with sauteed chanterelles and steamed corn on the cob. Off I went on my business trip. My family consumed the rest of the gratin as leftovers. The next thing I knew, the deadline for Top Tomato was looming. I sketched out this recipe and got it in under the wire. Time went by and I just assumed that my recipe did not make the cut. Next year, I thought, I will have to put in a bit more planning and effort. Just when I gave up on it, I got the call from the Post that they loved the recipe and it was a finalist. This recipe works just as well with lobster meat, crab, or shrimp. Enjoy.